I love the Regency period and the activities the peerage indulged in. In particular, for men, the hunting season was eagerly anticipated. The traditional end of the London Season was considered the Glorious Twelfth of August, which marks the beginning of the shooting season. Society would retire to the country to shoot birds during the autumn and hunt foxes during the winter, before coming back to London again with the spring. It’s pretty obvious that to chase foxes, and hunt game of any kind, you had to have a large country estate, hence why hunting was a sport for the wealthy. Those who did not have the means to own such large estates, were ever hopeful to be invited to join a shooting party a a wealthy man’s hunting lodge. Remember, hunting on someone else’s land was considered poaching (theft), the the penalties for such activities were severe, sometimes resulting in deportation or even hanging. Just the name ‘hunting lodge’ sets a vivid picture in my mind of cool autumn days, big log fires and men playing billiards after dinner. For the bastion of gentry, a hunting lodge was seen as a necessity. What else were you to do with your time when the London social season finished. They had to have something to do with their time. In my current work in progress, A TASTE OF SEDUCTION (book #5 in my Disgraced Lords series), my hero, Lord Hadley Fullerton, owns a hunting lodge in Surrey. As the second son of the Duke of Claymore, Hadley was left Lathero by his grandfather. 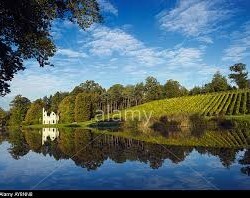 However, he used part of the large estate to grow grapes and make sparkling wine. Why? Because he needed money—badly. As a young boy he’d accidentally burned down the Claymore Manor house and as such the rebuild almost bankrupted the family. He’s trying ot make up for his error, even though he was only eleven at the time. I have based Hadley’s home on Cranborne Manner, Dorset, Southern England. 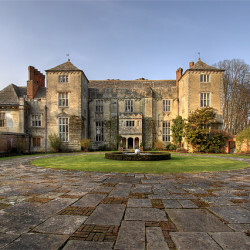 The Manor is the home of Viscount Cranborne, the eldest son of the 7th Marquess of Salisbury. The original Manor house was built as a royal hunting lodge for King John in the 12th century. Cranborne Chase was a royal hunting ground from at least the time of William the Conqueror until the 17th century. Salisbury and Chief Minister to Queen Elizabeth I and James II. Under the 2nd Earl, in 1647, the west wing was remodeled by Captain Ryder, an associate of Inigo Jones. At the beginning of the 17th century the garden was laid out by Mounten Jennings and John Tradescant who supplied many of the original plants. The estate consists of a 3,000 acre in hand farm and over 1,700 acres of woods, as well as the park and gardens. Hadley has used many acres to grow his grapes in order to make money. One of the first men to plant commercial vines in the UK was the Honorable Charles Hamilton, the 9th and youngest son of the Earl of Abercorn. As you can see, younger son’s had to make a living. Charles created Painshill Place in Cobham, Surrey in 1738. Painshill is now run by a trust and you can still visit to see the wonderful gardens and follies he created. Included in the gardens were an Abby, a Roman temple, a Turkish tent, a Temple of Bacchus, a fantastic shell-filled grotto, a hermitage, and some Roman steps. The picture below is the vines planted near the Abby. By the late 18th century, Painshill was selling 6 variety of wines for 60 guineas a barrel (equivalent of 7,500 pounds in today’s terms). Highly profitable for it’s day. The duty on French brandy and wines during the Napoleonic wars and shortly after, also saw the rise in sparkling wine produced in England. The production of wine in England was and still is fraught with problems given the unpredictability of the weather. Hadley was a brave, if not a tad desperate man to try but as he’s my hero and I love him, he does succeed—both in love and in viticulture. A WHIPERS OF DESIRE book #4 in the Disgraced Lords series is up for pre-order and is getting good reviews!